Do you know what blogs are? If you don’t, then you’ve come to the right place. In the beginning, a blog was more of a personal diary that people shared online, and it goes back to 1994. In this online journal, you could talk about your daily life or share things you do. But, people saw an opportunity to communicate any information in a new way. So began the beautiful world of blogging. There are many reasons for starting a personal blog and only a handful of strong ones for business blogging. Blogging for business, projects, or anything else that might bring you money has a very straightforward purpose – to rank your website higher in Google SERPs, a.k.a. increase your visibility. As a business, you rely on consumers to keep buying your products and services. As a new business, you rely on blogging to help you get to these consumers and grab their attention. Without blogging, your website would remain invisible, whereas running a blog makes you searchable and competitive. So, the main purpose of a blog is to connect you to the relevant audience. Another one is to boost your traffic and send quality leads to your website. The more frequent and better your blog posts are, the higher the chances for your website to get discovered and visited by your target audience. Which means, a blog is an effective lead generation tool. Add a great call to action (CTA), and it will convert your website traffic into high-quality leads. But a blog also allows you to showcase your authority and build a brand. When you use your niche knowledge for creating informative and engaging posts, it builds trust with your audience. Great blogging makes your business looks more credible, which is especially important if your brand is still young and fairly unknown. It ensures presence and authority at the same time. 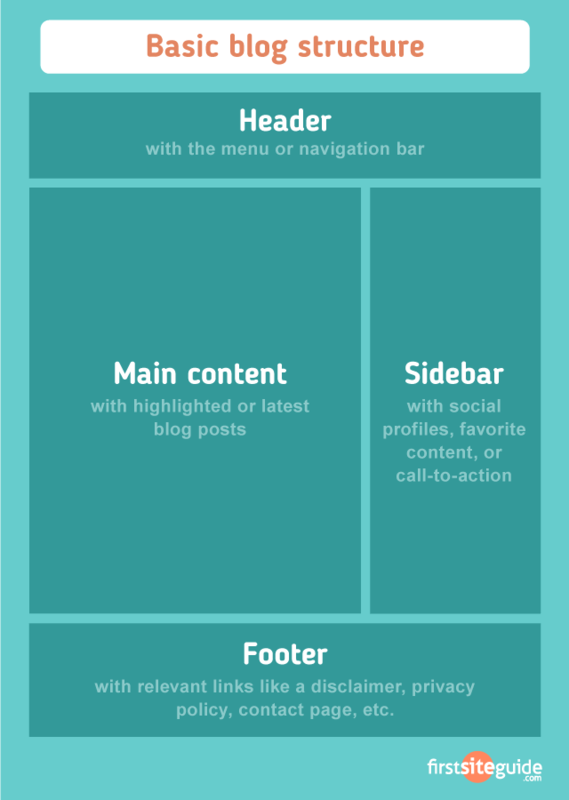 <a href=”https://firstsiteguide.com/wp-content/uploads/2018/04/What-is-a-Blog-2.png” alt=”Basic blog structure”></a><br />Basic Blog Structure free template was created by <a href=”https://firstsiteguide.com/”>FirstSiteGuide.com</a> team. Above example is the basic structure of the blog. Each item has its own importance and helps visitors to navigate through your blog. A majority of people still wonder whether there is any difference between a blog and a website. 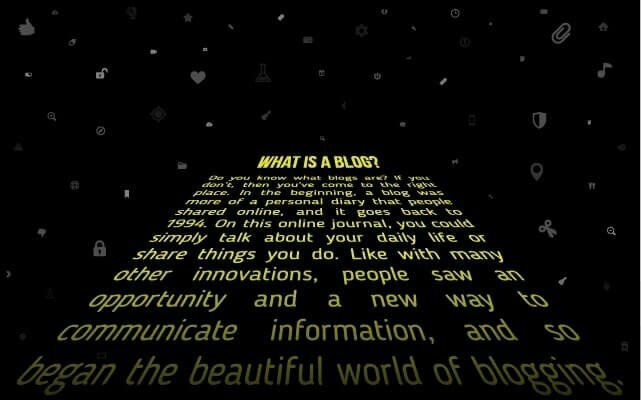 What is a blog and what is a website? It’s even more challenging to differentiate between the two today. Many companies are integrating blogs into their sites to perform the same function. What differentiates blogs from websites? Blogs need frequent updates. Good examples include a food blog sharing meal recipes or a company writing about their industry news. Blogs promote perfect reader engagement. Readers get a chance to comment and voice their different concerns to the viewer. Static websites, on the other hand, consists of content presented on static pages. Static websites owners rarely update their pages. Blog owners update their site with new blog posts on a regular basis. Key elements that identify a blog post from a static page include a publishing date, author reference, categories, and tags within a byline. While not all blog posts have all those by line elements, static website pages do not have any of these items. From a visitor perspective, the content on a static site will not change from one visit to the next. The content on a blog, yet, has the potential to offer something new each day, week, or month. Depending on the blog owner’s publishing schedule. Blogging is the many skills that one needs to run and control a blog. Equipping web page with tools to make the process of writing, posting, linking, and sharing content easier on the internet. It’s important to mention that blogging grows with each passing day! 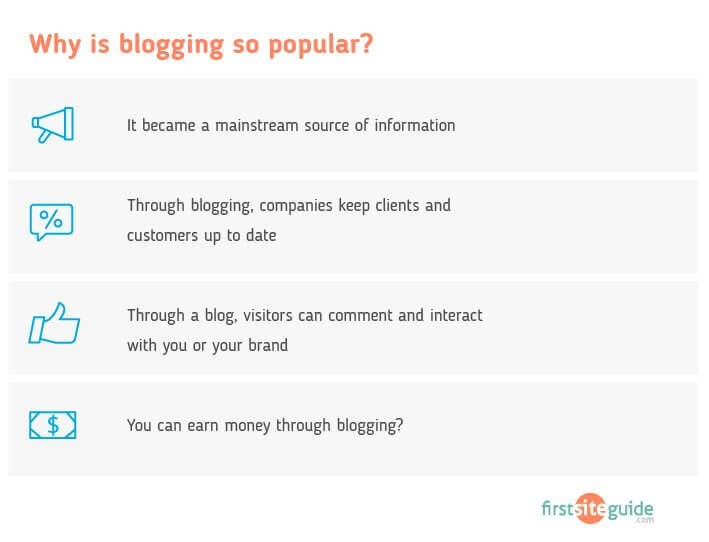 Hence, to answer the question ‘what is blogging’ we need to look at the factors behind its rise. In the early stages, blogs became mainstream, as news services began using them as tools for outreach and opinion forming. It became a new source of information. Businesses saw a good way to improve the customer’s level of satisfaction. Through blogging, companies keep clients and customers up to date. The more people visit your blog, the more exposure and trust your brand gets. Personal and niche bloggers, saw the potential to reach to more people interested in specific topics. Through a blog, visitors can comment and interact with you or your brand which helps you create a network of loyal followers. Did you know you could earn money through blogging? Once your blog gets enough attention and fans, you can look into ways of monetizing your blog. Through the blog, you can offer your services and sell products. In recent times, bloggers have become famous for various reasons. An alternative career or job to many, more people are choosing to join the ranks. So who are bloggers? These are individuals who love sharing parts of their lives with you. They post various topics from arts, home designs, carpentry, and finance articles. Bloggers are mobile and don’t need to be in one place. They live on the internet! Why are many people blogging today? Would you want to have a blog of your own? Yes! Most people today are creating a blog for various reasons. Every human being has its story to tell. Hence, through the internet, bloggers can communicate to a larger group of people. Why is blogging so popular? Blogs allow you to talk about any topics and express your opinion. You’ll find some bloggers writing on every activity that took place during the day. These may range from small issues such as waking up, to major issues like human rights and climate changes! Remember that as a blogger running your own blog, you need to rely on the topics that you love and strive to become one of the best blogs on the web. Bloggers do earn money, but this is not a get-rich-quick kind of profession. Before you can start monetizing your blog, you need to build both your Google SERPs ranking and your niche influence. And that takes plenty of time and quality content. Money-making opportunities won’t present themselves until you’ve gained some credibility in the field. So, get down to business. Selling ad space on your blog privately or via Google AdSense. Becoming an affiliate partner privately or through ad networks. Selling your own digital products such as eBooks and tutorials. Selling memberships for access to exclusive content or advice. Using your blog as a content marketing tool for your business. If you’re starting a blog as a way to market and boost your existing business, you probably won’t be selling ad space or memberships. But you can create and start offering exclusive digital products such as eBooks, guides, or online courses as a lead capturing tool in exchange for visitors’ email addresses. That way, you’ll nudge them one step further down your sales funnel. Want to start a blog on your own? Creating your own personal blog takes a few steps. First, you need to decide on a name for your blog also called a domain name, and choose the best blogging platform. We recommend going with the self-hosted platform. There are few choices when it comes to self-hosted platforms but the most popular is WordPress.org. Then you need to choose a web hosting provider and for new bloggers, we recommend Bluehost, a company that powers over 2 million websites worldwide. You will get a Free domain name when you sign up with them and if you don’t like their services, they offer a 30-day money-back guarantee. Just type in a desired domain in this “new domain” box and BlueHost will show you whether it’s available or not. If not, it will provide you with a list of similar names for you to choose from. 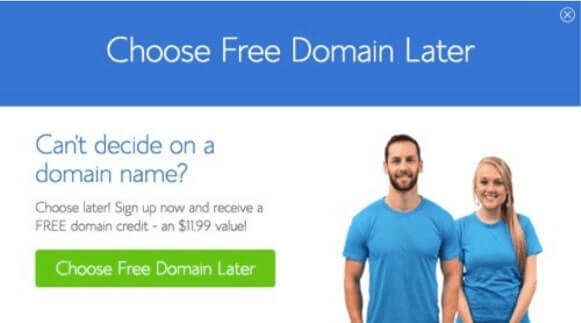 If you can’t get the domain name you like, Bluehost will help you by letting you choose one later. That will give you time to do some research and thinking. If you need more information, check out our step-by-step tutorial on creating a blog on your own using Bluehost! We hope that you’ve learned something important when it comes to the world of blogging. If you’ve managed to start a blog then your next step is to work on your blog content in order to keep your future readers satisfied and engaged. Feel free to check out our extensive list of blogging resources which will help you run and grow your new blog. it is a very useful article……now I’m gonna create a blog. Thank you so much. This article cleared my basic confusions about the blog. It is very helpful in learning basic concepts. This is the best article on the concept of blogging. I am writing on blogging and I wanted insight. That, I got. The scope of the article is valid. Well done. Will revisit soon. Bravo! This is a very valuable article. I will now start my blog without any difficulty. Thanks for sharing information about “Blog” & “Blogging”, can you please also guide me about Academic Blog Writing? Or what tips/rules should I follow to increase my viewers on my Academic blogs? I really appreciate it as you made blogging easier. Keep sharing such informative articles. I think I should start blogging, thanks for your awesome post. Nice post shared here. Good work and keep it up. Wishing you a very warm and blessed Happy New Year 2019. Clean and nice explanations, thank you! I am planning to start Blog, Nice article it helps lot. Thanks for your article. Really helpful. Good article. Great to know. Thank you for sharing this great information. This information is very helpful for me. Nice article, very informative. Keep the good work going. Great Post! All the points and steps are very clearly explained. It is very informative and interesting to read. It was so fun reading your article and have provided much information needed for the industry. Iam using Blogspot as my professional platform. I love it, it is simple and easy to use. Plus benefit is Blogspot is owned by Google so basically, u have more chances to rank ur site in google. Thanks for the post mate. keep posting such kind of stuffs. Thanks for this, it is informative for new ones. Definitely a Good guide for bloggers. I would recommend this article to beginners and experts in their field. This is something great and perfectly described. These tips and way of explanation will surely help those newbies. Keep posting such kind of kinds of stuff, Thanks a lot mate! Thanks Komal for your kind words! Hey Admin, your blog post is very useful and informative, especially for those who are new in the blogging field and don’t know much about blog writing. Love that you shared those three simple do’s, Johnathan. I’m going to keep those as my focus weekly. Good luck with your blogging journey! I agree…it is a true power of the blogosphere. Thanks for following our blog! ps. BTW, love that you listed a few blogging ideas here! Glad that you like the post Janis. This is great, I haven’t realized blogging has been around for that long. That Bradley’s video cleared up some things for me! Thanks for your comment, Daniel. Glad that you liked the video! Useful article for future bloggers! Thanks Mike. Glad you find it useful! Bookmarking the blog for future reference.